Among them was Craig Spaulding, a former Madison nightclub owner turned self-employed handyman. “I see the working conditions of these people and it makes me sick,” he said. The event was organized by Wisconsin Jobs Now!, a Milwaukee-based nonprofit. Media were not alerted and lead organizer Kelly Benjamin was not thrilled that a reporter with the Wisconsin Center for Investigative Journalism showed up. “If we wanted the press to be here, we would have invited press,” Benjamin said. Wisconsin Jobs Now! has in recent months been targeting fast food franchises and other stores in Milwaukee, Madison and Wausau as part of a national campaign led by the Service Employees International Union. Participants want a wage of $15 an hour and the right to unionize. Janet Veum, spokeswoman for Wisconsin Jobs Now!, says there have been protests at more than 50 state businesses with at least 300 workers going on one-day strikes. Media weren’t told of the Sept. 17 event because it focused on repercussions to a participant. “We don’t want workers to say, ‘See what happens?’” She says such repercussions are rare. On Aug. 29, when protesters visited this Family Dollar, employee Ewanda Olinger was moved to join in, after locking up the store. She was subsequently fired. Olinger was purportedly told she locked a customer inside, but maintains that the store’s security sensors would not let that happen. 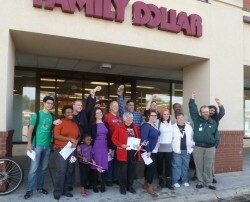 Family Dollar has 7,900 stores in 46 states, with 55,000 workers. None, confirms Winburn, is represented by labor unions. Olinger was at the Sept. 17 event with her daughter Carleen, age 4. Also present was state Rep. Melissa Sargent, D-Madison, with the goal of getting Olinger rehired. Sargent earlier helped a protest participant at a fast-food chain whose hours were cut. Conservative news outlets have pounced on Wisconsin Jobs Now!, calling it a “front group” for SEIU and noting that its officers enjoy salaries well above the state minimum wage of $7.25 an hour. Wisconsin Jobs Now! received $583,700 from SEIU in 2012, federal filings show; Veum says the group’s 2012 revenue totals are not yet available. SEIU reported giving Wisconsin Jobs Now! $769,023 in 2011; that year, the group reported total revenues of $770,680. The registered agent for Wisconsin Jobs Now! is Bruce Colburn, a vice president at SEIU HealthCare Wisconsin; its executive director is Michael Lauer. Federal filings show Colburn and Lauer drew salaries and extras of $135,048 and $130,792, respectively, in 2012. Veum says those compensation rates “would be considered low-pay at a lot of corporations.” She thinks it’s more appropriate to ponder the salaries of CEOs and workers at targeted companies. Family Dollar CEO Howard Levine made $5.2 million in fiscal 2012. Olinger, who worked at the chain for six years, says she was paid $11 an hour. Shortly after 10 a.m., the protesters discretely entered the store. One bought some American flag pinwheels. Sargent explained her purpose to a store employee, who said the manager was not in. Sargent vowed to keep trying. Locking up a store and walking off the job is enough of a reason for me to fire someone. I doubt their one day strike really affected the bottom line. Here’s a novel idea. Start a business and then you can people however much you’d like to. Should be pretty easy.